Preheat your oven to 400 degrees. Combine all your dry ingredients and mix well; set aside. In a separate bowl, cream your sugar and butter together. Mix in one egg at a time until well incorporated. Slowly add in your buttermilk. Add your dry ingredient mixture a little at a time until all ingredients are mixed well. Make sure mixer is on low and add the dry stuff in slowly or you'll have a flour bomb! 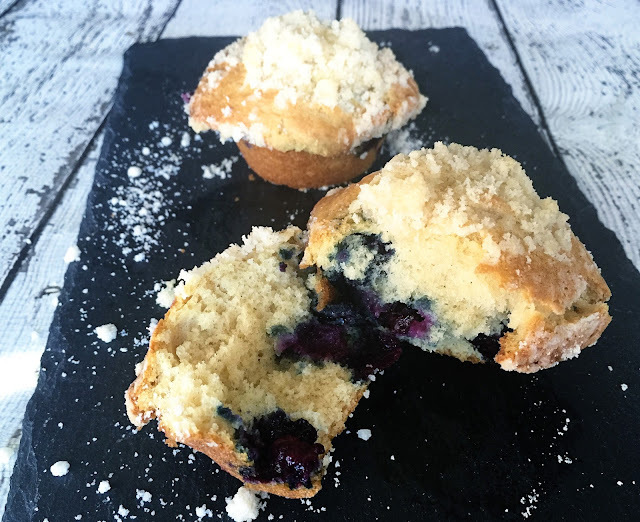 Using a rubber baking spatula, gently fold in your blueberries - Yes, this is a thick batter which makes the perfect consistency for the muffins! To make the streusel, simply combine the butter and sugar and mix in flour and cinnamon until crumbly. Line your muffin tin OR spray them well with a "baking spray with flour" type cooking spray (CLICK HERE if you have no idea what I mean). Fill your muffin tins about 2/3 of the way up and top with crumbled streusel topping. Bake at 400 degrees for 12-15 minutes or until a wooden toothpick stuck in the middle comes out clean – makes approximately 30-36 muffins (We like big batches at our house!). Make sure that your tin gets cooled and cleaned in between batches, or use 3 different tins! Allow the muffins to cool COMPLETELY. Place them back into the tin (or in a casserole dish) and freeze them for 2 hours in the freezer. Remove the muffins from the tin and place in one-layer, in gallon-sized Ziploc type bags to store in freezer for up to 3 months. When you are ready eat them, just grab a few out of the bag and pop them in the microwave for 15-30 seconds!! Instant from scratch breakfast any day of the week with no mess! With fall already here and in my case, a baby around the corner, I’m working on stocking up on some of my favorite easy fall comfort foods to get me through those first few weeks of sleepless nights. Nights are getting chilly and the smell of wood fires are starting to fill the crisp night air. What better way to feed your family, and your soul, than with a perfect pot roast paired with the perfect gravy? This is my go-to easy dish this time of year. It is nearly effortless thanks to the crock pot doing all the hard work and it is absolutely scrumptious!! It doesn’t hurt that it will freeze and re-heat to perfection as well! In a dutch oven or skillet, heat a few tablespoons of olive oil. Liberally salt and pepper the entire roast; rub it in good! Place the roast in the skillet and sear both sides. Place the roast in your crock pot, top with all veggies. Mix the 4 cups of water with the cornstarch and seasonings (except the salt and pepper since you already used those on the meat). Cover and turn your crock pot on the “High” setting for 6 hours. When the roast is done, separate the cooking liquid (about 3 cups) from the roast and veggies and begin the gravy! Melt the butter in a medium sauce pan over medium heat. Whisk in flour a little at a time until incorporated. Allow the butter and flour to cook for a minute or two while you whisk constantly until you see the mixture start to brown a bit. Add in the cooking liquid and some salt (a big pinch) continue to whisk until incorporated. At this point you can go to medium-high heat whisking occasionally until the mixture reduces to about 2 cups. The gravy will thicken as it cools. Serve this immediately with the pot roast and enjoy! 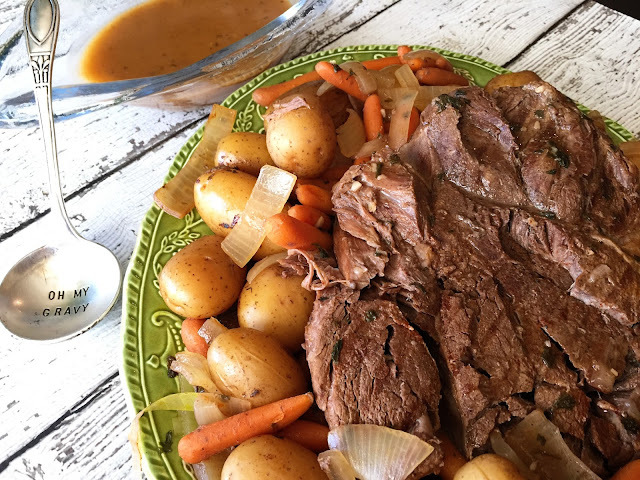 If you are freezing your cooked pot roast, you should freeze the roast and veggies with a little of the cooking liquid in one container and freeze the gravy in a separate container. I like to freeze the pot roast in a disposable foil casserole dish with foil lid so that I can just pop it in the oven at 325 for an 90 minutes to reheat! I took a recent trip to Cabo with some of my closest gal pals as sort of a last hoorah with the ladies before I become a mommy. You can check out pics from my trip on Instagram. We had all our favorite groceries to cook amazing meals, the girls had all their favorite beer and margarita mixes but we found it incredibly hard to find a mixer for strawberry daquiri's to have on hand at the house when the inevitable craving came on - sans alcohol for me obviously...baby on board and all! As you can guess...that didn't stop me! I grabbed some frozen strawberries, my favorite citrus fruits, sprite and simple syrup and we had all we needed to get the lazy-pool-lounging party started! (Clearly I run with a rowdy crowd!) I started making these when I was a kid, the grown-ups would make margaritas while we were in Mexico, but since I'm not a big lemon-lime fan....I decided I could whip up some virgin daquiri's for me and my sister. I played around until I got just the right combo for the perfect daquiri....little did I know that someday I could add rum and it would REALLY rock my world! 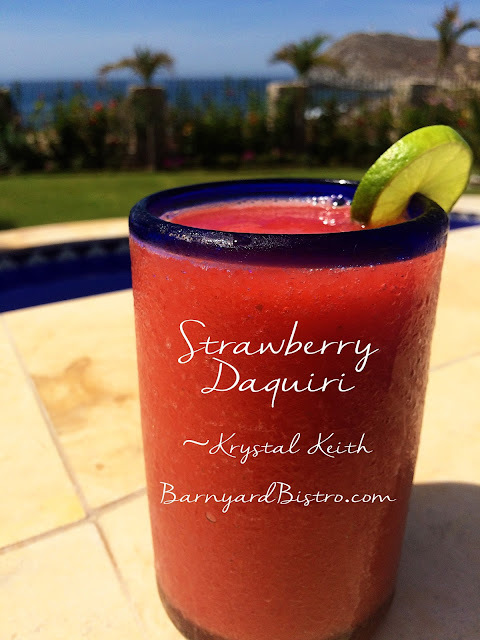 Once the daquiri's started flowing for me and the girls in Cabo....Margarita's were a thing of the past. Let me know what you think! Put all ingredients in a good blender and blend until smooth. Makes 2-3 drinks. Bring to a boil and stir until sugar is completely dissolved. Allow to cool completely before use. This recipe makes a little over a cup of simple syrup. This is one of my favorite indulgent breakfasts. 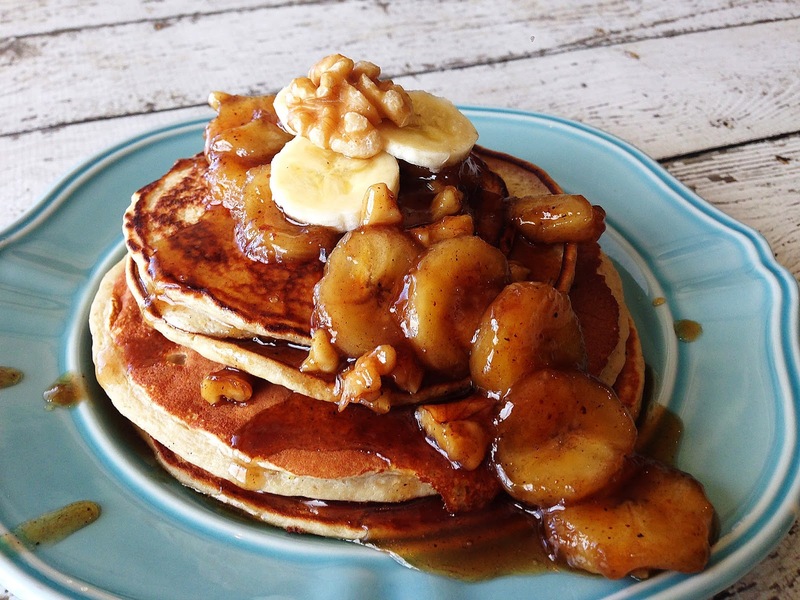 It combines one of my favorite breakfast foods, pancakes with one of my all time favorite desserts, Bananas Foster. If you haven't ordered Bananas Foster at a restaurant, go ahead and put it on your foodie bucket list because it is a must! Bananas sauteed in brown sugar, butter and rum. They light the mixture on fire, which is always fun, and serve it over vanilla ice cream. Sounds like the perfect topping for pancakes too, huh? That’s exactly what I thought! Make pancakes using my protein pancake recipe found on The Barnyard Bistro for a hearty, healthy pancake or use one of your own favorite pancake recipes. In a small or medium skillet melt butter, brown sugar and maple syrup over medium heat. Once the brown sugar has fully dissolved add the walnuts and sliced banana. Toss to coat bananas and heat them through. Pour over pancakes and serve immediately. I've missed y'all! I took somewhat of a hiatus in January but I assure you, good things are coming your way for Febrary......Starting with the pinkest, loviest, heartiest (yes heartiest), most glitter-bombed day of the year, Valentine's Day! Kick off your special Valentine's meal with something different this year! The hubby and I almost always go Asian for our Valentine's Day dinner and we almost always start our dinner with pork gyoza. This year I want to cook and have a low-key night at home but I thought it would be nice to stick to tradition, even at home. I have asked many questions at our favorite sushi and Asian hotspots to understand what is in gyoza and how they are cooked so that they have a little crispy browning but stay so soft and moist at the same time. Taking all of that information, I played around at home until I came up with my own version of pork gyoza. The gyoza dumpling was actually the easy part believe it or not. The sauce was the hard part. I had to play around a bit until I got the right combination of flavors but I think I nailed it and it is hubby approved as well. I know it has quite a few steps but it really isn't too time consuming and you get into a quick groove. Start to finish in 25-30 mins once you get the hang of it. I know that y'all are going to love this fun little appetizer. Combine the ingredients for the sauce; set aside. In a large mixing bowl combine the pork, cabbage, scallions, and ginger. To really incorporate all the ingredients you've gotta get your hands dirty! 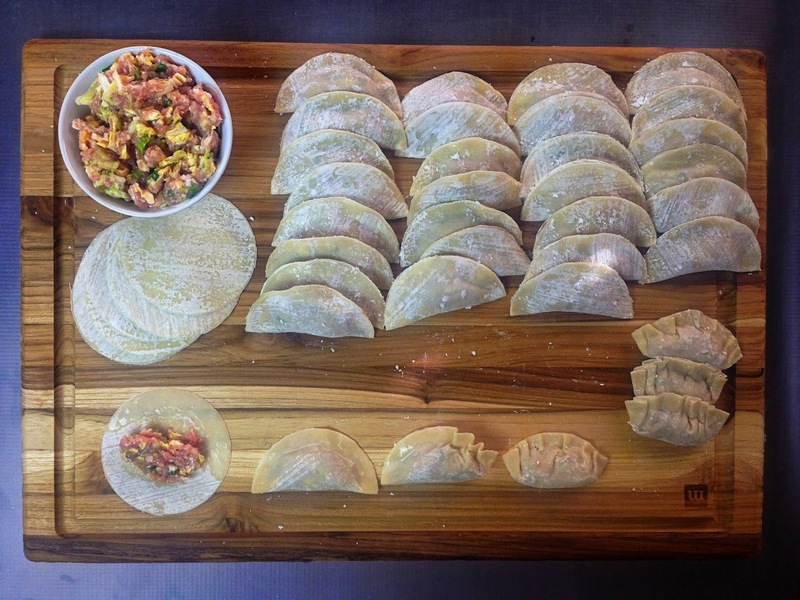 If you found the round wonton wrappers, yay for you...you're job is just a little bit easier! 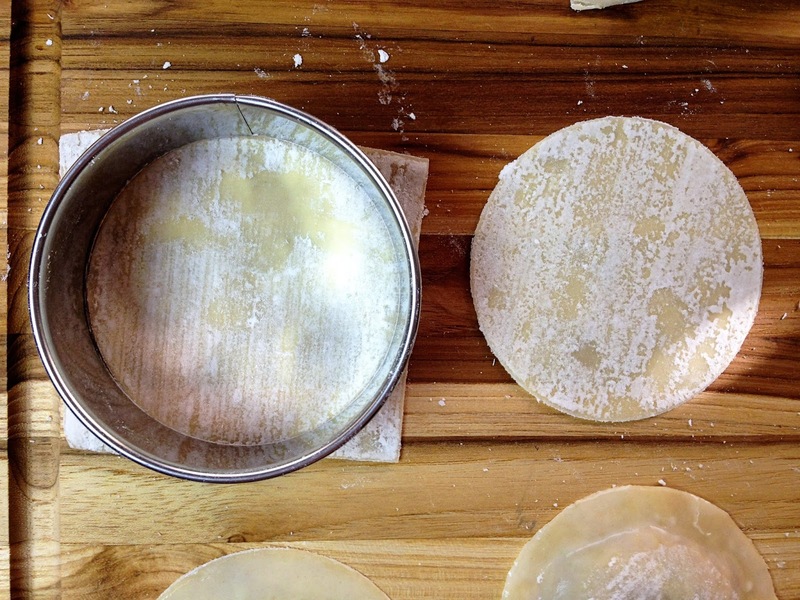 If all you could find is the square wonton wrappers, no big deal, just grab a round cookie cutter that is about 3.25 inches in diameter and cut 5 at a time as you begin to construct your gyoza. Here is the overall process but don't worry, I'll break it down step-by-step below. First, place approximately 1/2 Tablespoon in the center of a wrapper. Then, brush some warm water along the edge of the wrapper and fold the wrapper in half pressing firmly from the center outward to push out air bubbles. Then Brush some warm water along the outside of the fold and pleat inward from both sides like the photos below. Repeat until you have contructed them all. To cook them, heat a non-stick skillet (one with a lid) over medium heat. Place 8-10 gyoza in the pan. Once the bottoms have browned a bit, pour approximately 1/3 cup water in the pan and cover. Let cook for 5-8 minutes until cooked through. Repeat with a second batch if desired. Serve with dipping sauce. 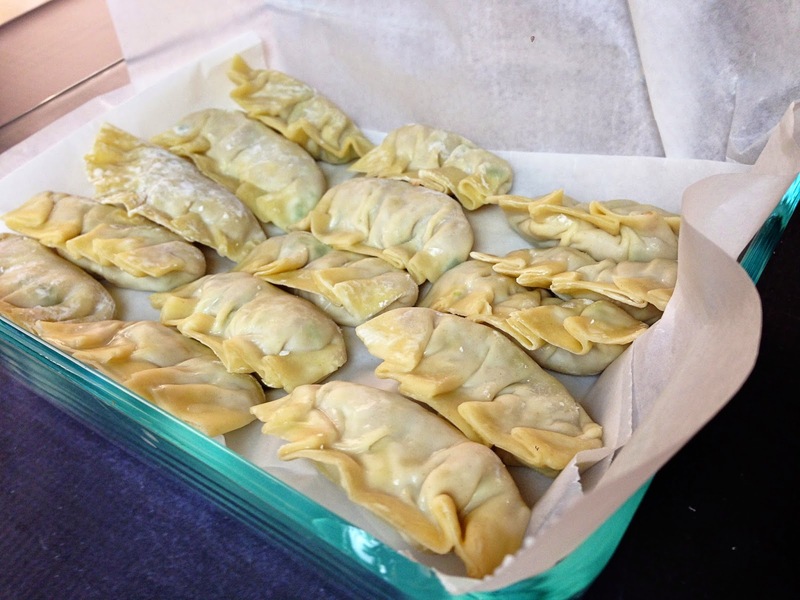 Any remaining uncooked gyoza can be stored and frozen to be cooked later. Place wax paper in the bottom of a freezer-safe dish with a lid. 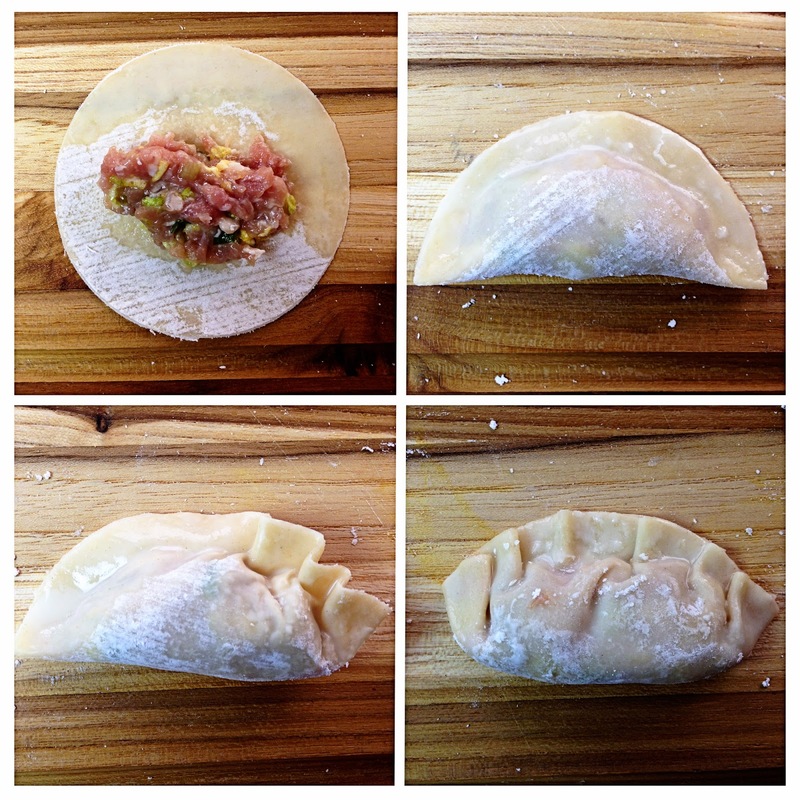 Place gyoza in single layers separated by wax paper. When you are ready to cook them, remove from freezer and thaw them out before cooking. 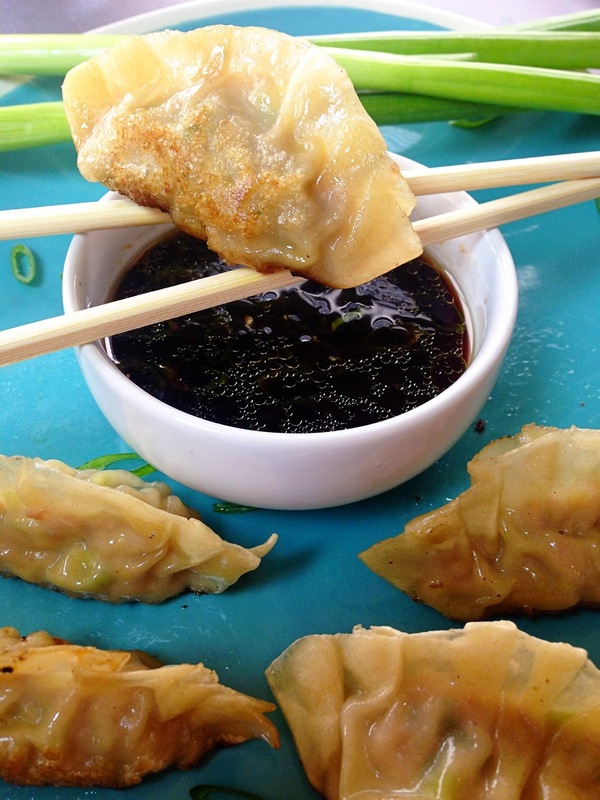 This recipe makes approximately 60 gyoza dumplings. Happy New Year!! I hope that y’all had a cozy and festive Christmas and kicked off 2015 in style. I enjoyed some much-needed downtime at the beach with the family, but I’m glad to be back to making music and sharing dishes with you. I’m not usually a fan of New Year’s resolutions, but this year mine was to challenge myself in the kitchen, to introduce new ingredients and make delicious healthy swaps, and just try new things. 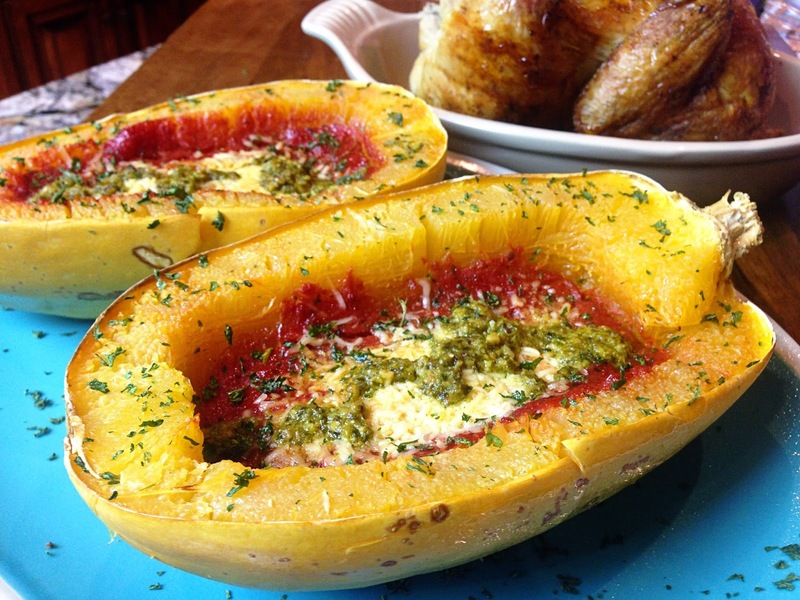 So, I’m starting the new year with spaghetti squash, one of my favorite underused vegetables. Ditch the regular pasta for this healthy substitute and you won’t be sorry. Once cooked, this squash turns into strings of “spaghetti,” which you can toss with your favorite pasta dish ingredients, and Voilà! This is a low-carb lover’s best friend, but if you aren’t dieting or watching what you eat, you’ll still love it…. Yes! It is THAT good.